Today I will be posting in English because I'm participating in Guylou's Christmas Blog Hop. Well it's more like a Christmas celebration! We want to thank you for your support and participation in our challenges during the past year. May this Christmas time be filled with joy and happiness for you and your dear ones. The hop starts at 9am and will end at 9pm today.That's about 2 pm here in The Netherland I guess. Following the blog hop order you can see that if you came from Kim's blog you are on the right path! If not please start at Guylou's Inimitability. There are nine words to collect on the eight DT blogs. The nine words are presented randomly and you will need to reorder them to discover the secret phrase. Once you have discovered the phrase, please come back and enter it in the InLinkz at the end of this post with your name and email address. I used paper from Maya Designs. I just love this paper! The text is from Card-IO. And how about the image. Isn't it gorgeous? You can win Christmas Carolers if you leave a comment on my blog! So don't forget to find the secret word in my post and head over to the next blog wich wil be Guylou's. I wish you all a lot of fun joining the blog hop and I wish you a joyous day! Carmen, I don't know that I'll ever be able to comfortably use a jillion pieces of paper like you! 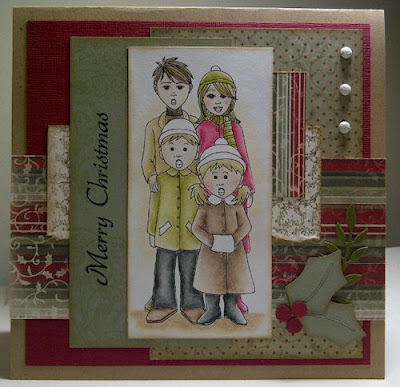 Your cards always have fabulous matching layers! This card is no exception, and you colored it wonderfully! Carmen, your card is gorgeous! I love all the detail. I agree with Trina, I'm not sure I will ever perfect the art of using a gazillion papers and other elments. But you do it so well. Thanks for such a beautiful creation on the day of my reveal! Wow, Carmen. Your coloring is gorgeous! I just love these rich papers, too. Such a beautiful card! An absolute stunner, wow, love it, fits perfectly together!! Gorgeous card! Your coloring is stunning!!! Gorgeous holiday card, Carmen! I love hte papers and the beautifully colored image! A gorgeous card. Love this image and your papers are lovely. Wonderful card! Great use of layering and I love all the details. Carmen, I absolutely love what you did with the Christmas Carolers! I love the romantic/vintage feel that you accomplish with your style of coloring, paper choices, and layering. Carmen, this is a lovely card. I'm very partial to traditional Christmas colors! Love the carolers. Your coloring is Awesome! Very pretty card with awesome layering!! Very nicely done and with beautiful colors and coloring! Merry Christmas! Beautiful card! Love the use of many pieces of card stock. They really compliment one another and your coloring. Wat een leuk zingend stelletje, mooie kaart en het afdrukje is erg mooi ingekleur. een leuke kaart, Car, heel mooi ingekleurd! Amazing, amazing coloring. Your design is so gorgeous. Just a beautiful card!